Three students made a project trying to get two Lego Robots to play a hunting game against each other inside a frame. Please study the link to the project by Kristan Andersen, Simon Lykke, Jacob Styrup Bang: esea-legolab.blogspot.com. It is a lot about sensors, it is a lot about software and tools for manipulating the input in due time and precise order, and it is a lot about designing for robustness. Physical devices never act exactly as you would assume. That only happens in pure software. The team succeeded creating a new sensor for the catching game making the two robots act against each other using the Lego NXT (R) tools. 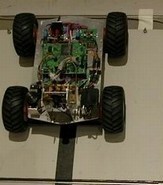 The two robots played like intelligent agents against each other without a 3rd computer acting as the controller. Of course, today it is too much to of a complexity to get you and me to understand the algoritmic details and sit down program the positions and adjustments to catch up for the normal invariance in physical components like wheels, gear, motors and sensors. We are not there yet where tools for that become ordinary off-the-shelf gear for any 12 year old gamer. However, the development of projects like this will create these tools and games one day, and the day is not far away. GamesOnTrack A/S is going to be part of that.